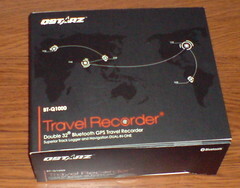 The Qstarz BT-Q1000 (available from Amazon.com ) is very well designed. In addition to being a sensitive GPS logger, it also has a Bluetooth mode. Both the packaging and the industrial design show a great deal of attention to detail. The only weak point is the software, which lacks the ability to download or extract GPS tracks from a particular date. Since the BT-Q1000 can hold tens of thousands of data points, this can mean a substantial amount of post-processing if you want to isolate particular track segments. 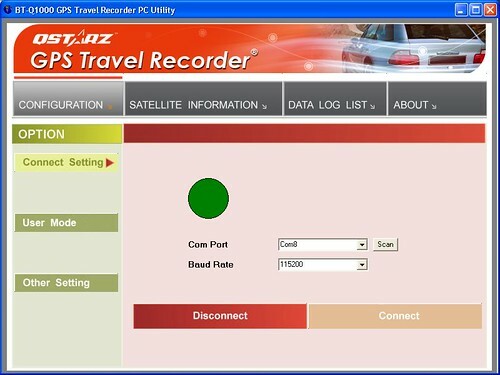 As long as you don't need Mac compatibility, and If you don't mind using separate software for photo geocoding, I recommend this unit as the best logger I have tested so far. There are a lot of things I like about the design of the device, particular as it compares to my previous favourite, the Globalsat DG-100. The Q1000 is compact, it has a slider switch to go into log mode (top position) or nav mode (Bluetooth, middle position). It has a red button to press to set a Point of Interest (the software will render each POI as a camera icon if you export to Google Earth). I do wish the button had a click action but instead it has little travel and is more of a squishy slight movement, which makes it difficult to tell if you've pressed it. If you're looking at the device, it will briefly turn the GPS signal indicator from orange to blue to indicate it is recording a POI, which is a nice touch. This contrasts with the DG-100 where the ability to set a POI is not clearly documented, supported or indicated, and the button to set a POI is also the power button (which is why I have been reluctant to test this feature on the Globalsat). The Q1000 also has a rubberized base, which makes it much easier to place on smooth surfaces without worring about it sliding off. The packaging is quite impressive, but they have put such effort into the design that you may accidentally overlook the battery, which is cleverly tucked into the side of the box. The package even includes a small carrying pouch. Since Amazon.com doesn't ship electronics to Canada, I got my Q1000 from anitec.ca for C$110. The PC Utility software seems to have no log split function. So how can I display only the required track and delete any portion of a track that is not required? You can save the log file as a *.csv first, and open it with Microsoft Excel. Split the log file as your desire via Excel and when you are all done, use PC Utility software to read the *.csv file and draw them on Google Earth. The sensitivity is quite good, I was able to get good tracks on several airplane flights (with it placed next to a window, with Bluetooth OFF ) and ok tracks in the skyscraper valleys of Philadelphia (where the Mio H610 was totally unable to get a location fix). The software presents you with a port selection page to start with, which could be quite intimidating, however you can basically just attach the GPS and set it on log, click on Connect and it will work fine. Download is quite slow even with a USB 2.0 set up and a high baud rate, 1 minute 15 seconds for 8344 records. As mentioned, you can only download the entire contents of the logger, you can't pick and chose (unlike the DG-100). Once downloaded, the data are displayed in a table in the UI but (and this is a pet peeve of mine) the window cannot be resized - the size of the UI is fixed. You can save (the entire download only) as comma-separated (CSV), Google Earth KML, or NMEA. As well, you can "Draw Map", which lets you pick a starting and ending record number, and will then map those data points in Google Earth. The display is still a bit confusing - it will make a folder "My Trips" with a line representing the ENTIRE data set ("My Path") and then also put in placemarks for your selected datapoints ("My Places"). It is quite simple to configure, using the software (there are no logging mode switches on the device itself, unlike the DG-100). The software supports real-time position and log download only - if you want to geocode photos using the data you will need additional software such as RoboGEO. Overall a well-engineered device. Here's a plot showing me wandering around downtown Philadelphia (produced by Saving and then processing using GPS Visualizer). 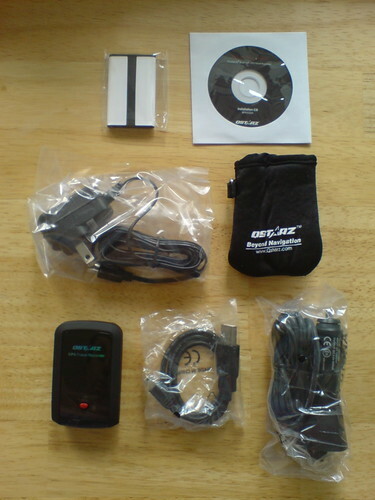 I think the Q1200 looks interesting, I've talked with Qstarz about getting one to review but I don't have one yet. GPSpassion.com said the antenna is a bit smaller (I guess since most of the surface is taken up by the solar panel) leading to reduced sensitivity compared with the Q1000. What information is recorded with the POI? I'm wondering if this could be used to (roughly) sync up a camera's time with the GPS's time. If the POI stores the time, then you could snap a picture at the start of your journey at the same time you hit the POI button. From this, you could get a rough offset. Tools like http://geotag.sourceforge.net/ can take an offset b/w the camera and GPS to apply to photos for geotagging. 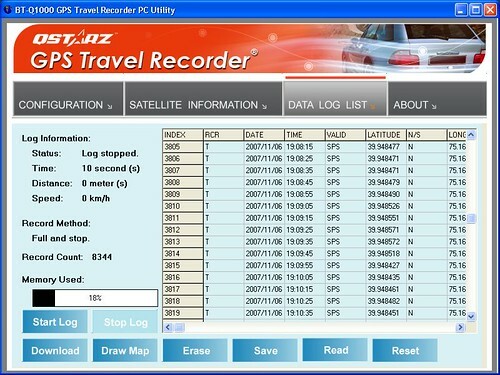 I do not know about you, but Travel Recorder 4.1 (April 11, 2008) write incorrect GSP info to the image and the (Canon) maker notes are not correct after the GSP data is written!